Debt Management for Excel tracks revenue and expenditure items on a monthly basis to manage budgets and debt obligations. Debt Management for Excel quickly and easily shows the current status of the budget and actions required to be to get out of debt and stay out. 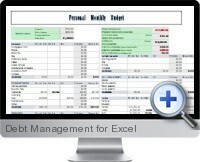 Debt Management for Excel is a fully automated Excel spreadsheet template to keep you updated on what expenses you have, when they are due, and how much you have paid towards them so far in real time.